Read our helpful guide to second hand Renault Megane. Why buy a used Megane? Which used Megane should I buy? AA Cars works closely with thousands of UK used car dealers to bring you one of the largest selections of Renault Megane cars on the market. You can also browse Renault dealers to find a second hand car close to you today. All used Renault Megane on the AA Cars website come with free 12 months breakdown cover. The Megane, produced since '95 and now on its beautifully designed third generation, continues to carve a successful niche in the hearts and minds of British drivers. The Megane III, launched in 2008, did away with the Megane II’s iconic hatchback, opting instead for a more self-contained look. The III models – Hatch, Coupe, Sport Tourer, Coupe Cabriolet and RenaultSport (WhatCar Best Hot Hatch for 2011) – each offer exceptional steering, superb road feel and real comfort. The front seating positions are roomy even in the Coupe and the boots are sizeable. As you would expect from Renault, the trims and engine alternatives are almost endless so speak to dealers with multiple sites and you’ll often find a Megane that feels tailored for you. Although first unveiled in 1995, the first Renault Megane to make a mark was the second generation model. A clever mix of style and affordability, it was named the European Car of the Year in 2003.Since then it has remained a leading choice in the family car market, and coming in a number of styles and body shapes, is a versatile and frugal car which boasts some of the most eye catching designs on the market. Renault Meganes are stylish, economic cars, and coming in a range of styles and shapes, there is sure to be something to please drivers of all ages. The first generation was released in 1995, but it was arguably only in 2002, with the second generation, that the Megane came into its own. This second generation featured a heavily redesigned look which included a unique - and now iconic - rear end. This also means that the Megane has good boot space, and so is as practical as it is good to look at. While the luggage space is ample, there have been concerns that there is a slight squeeze when it comes to rear passenger room, but room in the front is better. The Megane range has always been one of the best equipped on the market, and some of the most recent models benefit from a tie-in with TomTom which means that they come equipped with sat navs as standard. On the road, Meganes are comfortable and composed, yet this has led some drivers to comment that it makes for a drive that isn't as exciting as some of its rivals. On the standard model grip is good and steering is accurate and responsive, while the Renaultsport offers an altogether more exciting and purposeful drive. Running costs in the Megane are particularly good across the range, offering decent miles per gallon returns. One of the best however, is the 109bhp 1.5 dCi, which features stop/start technology in newer models, keeping CO2 emissions under the 100g/km threshold, and therefore qualifying it as exempt from road tax. One criticism is that Meganes don't hold their value very well, which might be a problem if you are looking to buy one new, but as a used car this means they come in at very affordable prices. Along with their stellar safety rating, their run costs and their practicality, Meganes are some of the best value cars on the market. The very first model Megane was introduced in 1995, but it was the Mk II, launched in 2002, that really caught the public's eye. 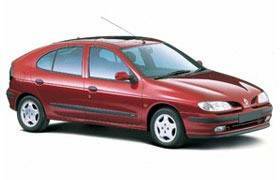 Here's a brief history of the Renault Megane, starting from the very first model launched in 1995. In 1995 the Renault Megane I was launched as a replacement for the Renault 149, and featured improved safety measures and ratings, while elsewhere it utilised much of the existing technology. The Renault Mk II was released in 2002 and signalled a completely fresh start. This model shared very little with the Mk I car it followed. In 2003 the Renault Megane was named European Car of the Year and sales soared. In the UK the Mk II Megane was one of the top five selling cars from 2004 right through to 2007. The Renault Megane RS was introduced in 2004, and included improved performance and a number of sport style redesigns. 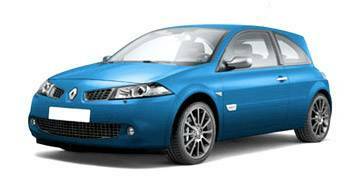 The Renault Megane Mk III was introduced in 2008 in order to remain modern and competitive. This model didn't feature the iconic rear end of the Mk II however. The Megane Renaultsport 250 Cup is named the What Car? Best Hot Hatch of the year for the third year running. There are a number of different body styles available in the Megane range, including hatchback, saloon and cabriolet options. Once you know what shape you are looking for you can consider some of these models and their key features. 16" Kaleido alloy wheels, Bluetooth connectivity, front fog lights, radio/CD player, Santiago dark carbon cloth upholstery, USB connectivity. 16" Kaleido alloy wheels, automatic lights, rain-sensing wipers, Carminat TomTom live satellite navigation system, Renault keyless entry with push button start, Java cloth upholstery, cruise control with speed limiter, leather steering wheel. 17" Celsium allow wheels, dual zone climate control, tinted rear windows and tailgate, parking camera with parking sensors, radio system, sport chassis with lowered suspension. 18" alloy wheels, automatic lights and rain-sensing wipers, brake assist, cruise control with speed limiter, ESC, ISOFIX points, LED daytime running lights, rear parking sensors, electrically adjustable and heated door mirrors. What should I look for when buying a used Megane? Meganes haven't always been known for their reliability, but if you check for a few of these key problems you will be able to find a good car that will run for years. Some Meganes have been known to suffer from electrical faults, particularly the front electric windows. Check these are in working order by making sure they open and close easily, then go on to check the remainder of the car's electrics (air conditioning, radio, lights, etc). Make sure that the key card is working, and if you can, insist you get a spare with your purchase. Headlamps are notoriously hard to replace, so make sure these are in working order to avoid a laborious bulb replacement process. Check the exterior of the car for rust or corrosion. Some Megane doors have been known to hold water, and so this could give rise to rust. Out on the road, test that the steering is responsive and that the brakes are working properly by checking the the car doesn't pull to one side when stopping. In 2007 there was a recall of the 1.5dCi model as there was a fault with fuel injection pumps leaking. Make sure, if you are looking at this model, that there is evidence of this work having being done. In the past there have been some reliability problems with Renault Meganes, but newer models generally fare better than the early generations. Watch out for a few of these key problems and you should end up a with a solid, practical car.